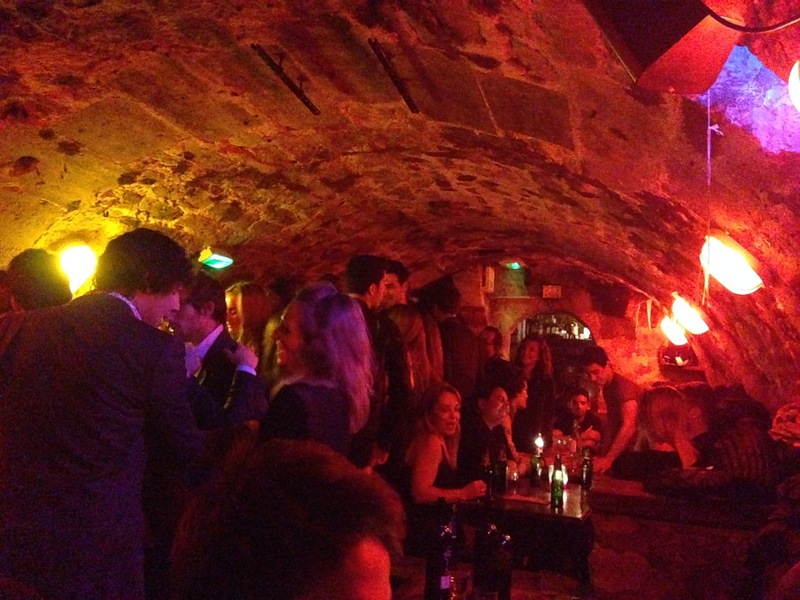 Chez Georges: Greatest Bar in the World? We met Lily outside an unassuming café/restaurant in the Saint-Germain area (the sixth) of Paris, the rest of the group not knowing the charms of the wine bar hiding below. I led them down the stairs into a stone arched cellar, cramped with people and lined on the walls with tables and chairs. At one of the room was a small counter where you could order wine by the bottle – I ordered the first one, their house white at €21. Nights at Chez Georges seem to have a standard progression from the two times I’ve visited (once before in 2012 with a friend studying in Paris). They start out slow – at a table if you’re lucky – and with casual glasses of wine and conversation. It’s definitely a conversation joint, although it’s a bit loud, and you’ll most definitely at points in the night have visitors to your table wanting to get to know you. Who says Paris isn’t friendly? The crowd consists of mostly French students and young people, with a few foreigners familiar with the area. Conversations get interrupted with bits of sing-alongs, usually quite calm and intermittent at first, and by the second bottle of wine you’re much more relaxed into the environment. By the inevitable third, there’s someone in the room standing on a table or bench singing along. You laugh and smile at the guy (in our case) and comment on how good of a time he must be having. This is usually about the time the *first* play of “Hava Nagila” comes on and everyone stops talking to clap and sing along. By the fourth bottle of wine (we did have four people! ), you realize that you’re the one standing on a bench or table singing and dancing but that almost no one is really sitting down at that point and there’s not enough room to dance without using some of the place’s higher ground. By the time you make it through the fifth bottle, it’s probably time to stumble over home and say goodbyes, and somehow we managed to make it without getting lost. You’ll wake up the next morning feeling not great but wondering how a cramped little wine bar creates such an amazing atmosphere. You’ll ask how you started talking to the five new French friends you made the night before. And most importantly, you’ll ponder when the next time you’ll make your way to Chez Georges will be and who you will bring to experience it.